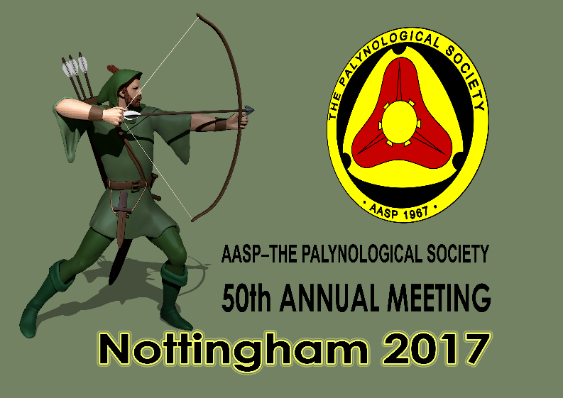 Welcome to the 50th Annual AASP Meeting. Note that the StrataBugs workshop, the Shell Biostratigraphy course and the Bradgate Park fieldtrip are all on Thursday 7th September. This clash is, unfortunately, impossible to avoid. Please make the payment in GB Pounds Sterling via PayPal. Should you be unable to register via this secure website, please mail a cheque for the registration package and ‘add-ons’ you require (make these clear in a covering letter) to Jim Riding (address: BGS, Keyworth, Nottingham NG12 5GG, UK). Please make cheques payable to THE MICROPALAEONTOLOGICAL SOCIETY. If you wish to pay outwith the TMS website using a credit or debit card, send your card details to the TMS Treasurer, Matt Hampton, at treasurer@tmsoc.org for processing. You can also pay TMS direct using online banking or BACS/SWIFT payments; email the TMS Treasurer, Matt Hampton, for the account details. Please indicate your name, and what you are ordering. Please add your registration and any extras to your cart, and then use the “View Cart” option to checkout and pay.